One day away from the start of the NBA playoffs, the Philadelphia 76ers still do not know the status of center Joel Embiid for Game 1 against the Brooklyn Nets. Embiid has been experiencing discomfort in his left knee, missing the Sixers' final two regular-season games this week. "I have no idea," Embiid said Friday when asked if he would be available for Saturday afternoon's game. 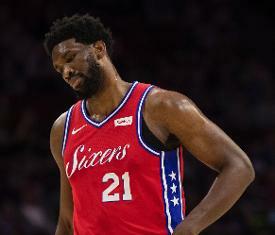 He was only a partial participant in the final practice before the playoffs begin, and general manager Elton Brand acknowledged that it was possible that Embiid could miss Game 1. "It's about the pain in my knee," Embiid said. "I've just got to keep working through it and see how I feel every day." Embiid, 25, insisted that the decision to play will be his. "[The team is] going to do whatever they can as far as getting me ready and healthy, but if my body doesn't respond based on the pain level, there's really nothing you can do," he said. The 7-foot Kansas product averaged a career-best 27.5 points per game this season with 13.6 rebounds. He averaged 33.7 minutes per game. But he missed five of the last seven regular-season games and 14 in all since Feb. 21.